Carbon nanofibers containing linear mesocage arrays were prepared via evaporation induced self-assembly method within AAO template with an average channel diameter of about 25 nm. The TEM results show that the mesocages have an elongated shape in the transversal direction. The results of N2 adsorption–desorption analysis indicate that the sample possesses a cage-like mesoporous structure and the average mesopore size of the sample is about 18 nm. Mesoporous nanofibers have attracted scientific interest over the last few years because they possess the specialities of one-dimensional nanomaterials as well as the properties of mesoporous carbon materials. The current methods to prepare mesoporous nanofibers mainly focus on the use of anodized aluminum oxide (AAO) membrane combined with the evaporation induced self-assembly (EISA) method [1–3]. 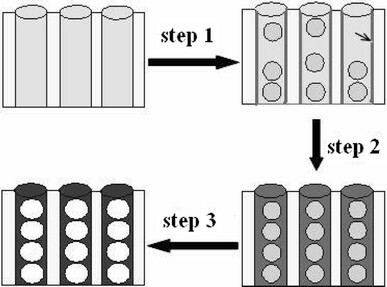 The EISA method is a simple but efficient way for the rapid preparation of mesoporous materials. Usually, the evaporation of ethanol concentrate the nonvolatile surfactant and precursor, thereby inducing the self-assembly of precursor-surfactant micelles and their further organization into liquid-crystalline mesophase . Mesoporous nanofibers of various materials have been prepared successfully by the aforementioned combined technique, in which mesoporous silica nanofibers have been studied extensively. The diameter of AAO channel plays an important effect on the mesostructure of nanofiber. Wu et al. successfully prepared silica nanofibers with several kinds of mesostructure, such as stacked doughnuts, helix, core-shell, and inverted peapod forms, using AAO template with nanochannel diameters in the range 20–73 nm. A single line of aligned mesocages with an average cage size of 14 nm was obtained when the channel diameter ultimately reached 18 nm . Chen et al. also reported the preparation of silica nanofibers containing linear arrays of mesocages based on the use of AAO template with channel diameter of 35 nm. The nanofibers containing linear mesocages arrays represent an interesting platform for various applications, such as drug delivery, sensor technology, and waveguiding devices [7, 8]. To our best knowledge, there is no report about the fabrication of carbon-based analogs of these mesostructures until now. The carbon-based analogs will possess significant advantages over these silica nanofibers, such as stability, electrical conductivity, and enhanced chemical functionality. Recently, our group has studied the restriction effect of AAO template for the shrinkage of mesoporous polymer and prepared mesoporous carbon nanofibers with large mesopore using AAO with channel diameter in the range 50–300 nm . Herein, we report the preparation of carbon nanofibers containing linear mesocage arrays via evaporation induced self-assembly method within AAO template with average channel diameter of 25 nm. The AAO templates with an average pore diameter of 25 nm were prepared by anodizing aluminum foil (purity 99.5%) at 20 V in 0.5 M sulfuric acid solution. The AAO templates with an average pore diameter of 200 nm were prepared at 120 V in 0.36 M phosphoric acid, followed by chemical etching with 0.3 M phosphoric acid for 1 h.
The precursor solution used to synthesise the carbon nanofibers is similar to that reported by Meng et al. . For a typical synthesis, 1.0 g of F127 was dissolved in 20.0 g ethanol, and then 20.0 g of resol-ethanol solution containing 1.22 g of phenol and 0.78 g of formaldehyde was added. After stirring for 10 min, a homogeneous solution was obtained. Several AAO membranes with average channel diameter of 25 nm or 200 nm were added into the solution. After the evaporation of ethanol at room temperature, the AAO templates were fully infiltrated with F127/resol composite. The infiltrated AAO templates were heated at 100°C for 24 h to thermopolymerize phenolic resins. The carbonization process was conducted in N2 at 350 or 700°C for 3 h with a heating rate of 1°C·min−1. After the AAO templates were removed by using 10% aqueous HF, the products were referred as PNF-x (for 350°C heat treatment) and CNF-x (for 700°C heat treatment), respectively, where PNF is the abbreviation of polymer nanofibers, CNF is the abbreviation of carbon nanofibers, x indicates the average channel diameter of the AAO template. 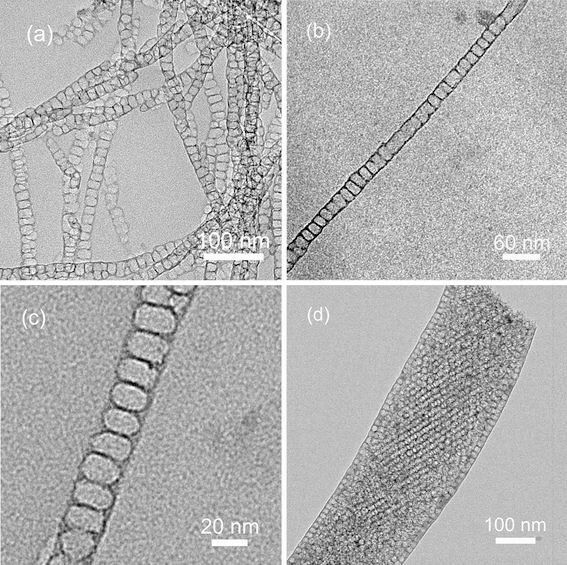 The obtained products were characterized by transmission electron microscopy (TEM; FEI, TACHAI-20), and nitrogen adsorption–desorption analysis (Micromeritics, ASAP2010). Figure 1 shows the TEM images of CNF samples. The average diameter of CNF-25 is about 25 nm (Fig. 1a, 1b), which is consistent with the channel diameter of AAO membrane. The nanofibers did not shrink integrally during the carbonization because of the tight connection between the surface of nanofibers and the pore wall of AAO . Moreover, the nanofibers contain linear arrays of mesocages. These mesocages are elongated in the transversal direction. The average size of mesocages is about 20 nm in the transversal direction and 16 nm in the direction of the fiber axis (Fig. 1c). Local distortion of the mesostructure can also be observed (Fig. 1a), which is due to the inhomogeneous channel diameter of the AAO template. When AAO template with an average channel diameter of 200 nm was used, three-dimensional (3D) stacked mesopores with average mesopore size of 13 nm formed within the carbon nanofibers (Fig. 1d). The formation of the carbon nanofibers containing linear mesocage arrays is schematically shown in Fig. 2. Homogeneous precursor ethanol solution containing F127 and resol infiltrated into nanochannel of AAO with channel diameter of 25 nm. F127 copolymers associated with resol molecules assemble into global micelles. Some free resol molecules were adsorbed to the surface of AAO channel to form a resol layer (indicated by array), since they both have a large number of hydroxyl groups (step 1 in Fig. 2) [11–13]. With the evaporation of ethanol, global micelles formed a single line within the channel of AAO. The resol layer adsorbed on the surface of AAO channel make the resol wall between the F127 micelle and the interior surface of AAO thicker than that between F127 micelles (step 2 in Fig. 2). The F127 was removed and mesocages formed after heat treatment at 350°C in N2, and further calcination enlarged the mesocage because of the restriction effect of AAO for the shrinkage (step 3 in Fig. 2) . The relatively thicker resol wall between the F127 micelle and the interior surface of AAO produced larger shrinkage, thus generated more nanospace in the transversal direction in the carbonization process, which produced the elongated shape of mesocages. Owing to the difficulty to synthesize enough amount of products for nitrogen sorption studies, N2 adsorption–desorption isotherms of all samples within the AAO templates are shown in Fig. 3. Typical type-IV curve with a clear capillary condensation in the P/P0 range of 0.8–0.95 is observed for PNF-25 and CNF-25 (Fig. 3a), implying a mesoporous structure with large pore size (larger than 10 nm). A very large H2-type hysteresis loop with delayed capillary evaporation located at a relative pressure of about 0.45 is observed in both isotherms, which indicates a cage-like pore structure with a window size smaller than 4.0 nm . The average mesocage size for PNF-25 and CNF-25 are about 14 and 18 nm (Fig. 3b), respectively, which indicates that the mesocage size of nanofibers increases with increasing heat treatment temperature. The sharp capillary condensation step of PNF-200 and CNF-200 was in the relative pressure range of 0.75-0.85 (Fig. 3a). The average mesopore size for PNF-200 and CNF-200 are about 11 and 13 nm (Fig. 3d), respectively. The mesopore size for nanofibers also increased with increasing heat treatment temperature. 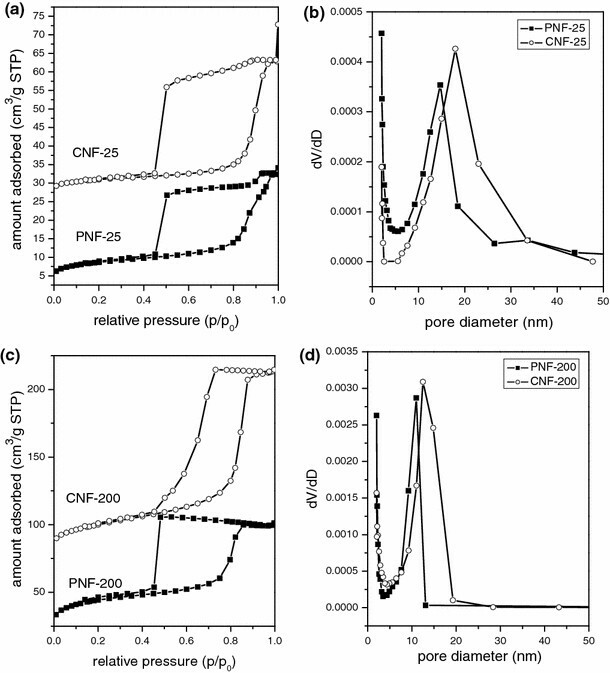 The delayed capillary evaporation of PNF-200 and CNF-200 located at a relative pressure of about 0.45 and 0.75, respectively, which indicates that the window size of mesopore enlarged in the carbonization process. Whereas, in the case of aforementioned PNF-25 and CNF-25, the window size almost keep invariant. Therefore, it is reasonable to assume that the window size is associated with the dimensions of mesopore arrangements. Relative to the 3D arrangement of the mesopores, 1D arrangement of the mesocages is not favorable to enlarge the window size. In summary, we have demonstrated the synthesis of carbon nanofibers containing linear mesocages arrays using AAO templates with an average channel diameter of 25 nm. The mesocages have an elongated shape in the transversal direction and possess a large pore size of about 18 nm. This work was supported by Natural Science Foundation of Jiangsu Province (BK2006195).